Nottinghamshire batsman Jake Libby's former coach believes his debut century will inspire other Cornish cricketers. The 21-year-old from Looe and is benefitting from the strong link forged between the two counties in recent years. "He's earned this summer, what he's done gives hope to other kids in Cornwall," ex-coach Sean Hooper said. "His patience, his mental toughness, no-one else recognised it, he just needed someone to give him a go." In July, Libby made an unbeaten double hundred at Edgbaston on his second XI debut for Notts and scores of 100 and 78 followed in his next match, leading to his first professional contract. 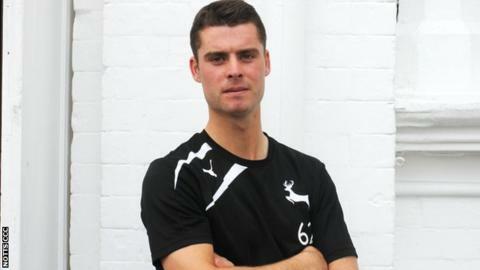 The Cornish connection with Nottinghamshire stems back to Hooper's university days when he played cricket and became good friends with the club's academy director Chris Tolley. The first player to benefit from the link was pace bowler Charlie Shreck who spent nine seasons at Trent Bridge, taking over 400 wickets, and now plays for Leicestershire. But many other cricketers, including the current Cornwall skipper Matt Robins, have travelled north since Shreck's debut in 2003 to take advantage of the first-class county's coaching set-up. The next Cornishman waiting in the wings at Trent Bridge is 19-year-old fast-bowler Ben Kitt, who has been impressing the former Worcestershire and Nottinghamshire all-rounder with his performances in the second XI. "Kitty has bowled some seriously quick balls this summer," Tolley told BBC Sport. "I've been really impressed with Ben, if he carries on making the same progress he has done this year, I'm hopeful he'll make the step up. "I had known for a few years how capable Jake was, it was about how consistent he could be and whether he could replicate his stunning summer form in the first team. "His hundred against Sussex was a superb performance against a serious attack in Steve Magoffin and Chris Jordan." Tolley was asked to set up the academy at Trent Bridge in 2000 and since then players from across the country have had help with funding coaching. The next generation of Cornish cricketers being helped include 15-year-old Tim Wyatt, who has taken up a scholarship at Trent College while his brother Sam, and fellow 13-year-old Lewis Goldsworthy, are travelling out to India next month to take part in a coaching clinic for spin bowlers. "We don't just cream players off the top, we want to help develop players and if they can come through on to the staff then great, if not, at least they'll be better cricketers," Tolley continued. "Notts is a small county and we need to look further afield, so it makes sense to try and widen our net. "We use an outreach programme but we're not trying to tie players to Notts, it's about the bigger picture."